Are you concerned with the sustainability of our planet and the actions of people in it? Having trouble seeing how living a sustainable life can coexist with popular culture and large corporations? It's possible! 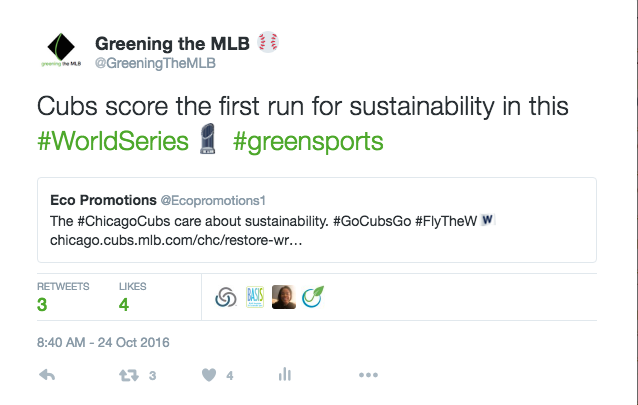 Greening the MLB started as a senior project but has and will continue to be used to drive interest in the green sports movement. As the true power of sport and sustainability lies in the size of the audience, the information used to determine this Green World Series Champion is pulled only from sources readily available to the everyday fan. That means information communicated outside of the organization. It’s one thing to have a really cool, well-performing, sustainable stadium -- but if a team isn’t telling people about it they’re missing huge opportunities both for personal PR/brand building and public outreach/issue awareness. Therefore, although each team may be doing more for sustainability behind the scenes -- things which many of my colleagues probably know about -- if the information did not come up in searches that a typical fan might do, it was not included in the analysis. That being said, if the Green World Series Champion were based only on the number of Google search results, the series would have been over in four games. Let’s see what fan searches reveal about the Cleveland Indians and their green sports performance. Progressive field has been recycling plastic, cardboard and aluminum since its inaugural year in 1994, but it wasn’t until 2007 that the Indians’ sustainability initiatives really took off. The Indians were the first team in the American League to go solar, installing panels with 8.4 kw capacity in 2007. The end of this year also started a major overhaul -- and improvement -- of their waste programs and the organization launched the “Our Tribe is Green” campaign in 2008. The Indians purchased two materials balers and began on-site sorting of recyclables. This reduced their trash haul bill and in three years halved their annual waste totals. The focus on recycling also increased local job availability. Progressive Field was chosen as the host location for the NRDC’s National Recycling Day in 2011. Read more about the team’s waste efforts and its impacts in this GreenBiz article. Reducing waste-to-landfill numbers even more, the Indians added organic waste composting in 2010. In 2012 they installed an experimental wind turbine. The goal for the project was not only to increase renewable energy production, but also aid in technology development and local jobs. Biodegradable retail bags in the team shops. Cleveland Green Venues Pledge (signed in 2011) - the Indians pledged to protect the air and water, preserve natural resources, increase green space, reduce consumption of raw materials and support the local economy. Another key component of this pledge is to reach out to fans, patrons and the community at large to teach the value and practice of sustainable living. Although not the most visually appealing, the “Our Tribe is Green” website offers tips to fans for being green at work, traveling green, and saving energy. **ding, ding** for a preliminary power of sport win. They can do a lot more -- strategically -- by way of using their voice to motivate sustainable behaviour change among the Tribe, but the Indians have made many great steps in the right direction. Go Tribe! 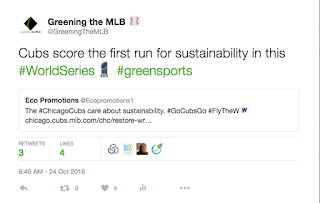 If it came down to sports sustainability alone, the Indians would have closed out the series over the Chicago Cubs by now, taking the Green World Series Champion title home to Cleveland -- will they finish the job tonight? As the true power of sport and sustainability lies in the size of the audience, the information used to determine this Green World Series Champion is pulled only from sources readily available to the everyday fan. That means information communicated outside of the organization. It’s one thing to have a really cool, well-performing, sustainable stadium -- but if a team isn’t telling people about it they’re missing huge opportunities both for personal PR/brand building and public outreach/issue awareness. Therefore, although each team may be doing more for sustainability behind the scenes -- things which many of my colleagues probably know about -- if the information did not come up in searches that a typical fan might do, it was not included in the analysis. So who takes the trophy, the Chicago Cubs or the Cleveland Indians? I gave a preliminary first run to the Cubs because they were the first team about which I saw something green sports-related (during Postseason). On twitter, mind you. But as twitter is where a lot of green sports discussion and info-sharing takes place, it’s a big place for me. Like any good green sports program, the Cubs have done some work to address waste. In 2010, the team partnered with Solo Cup Company, Allied Waste, Free Green Can and Levy Restaurants to introduce the "Real Fans Recycle" program at Wrigley Field. Through the program, fans could deposit plastic cups at specially marked recycling containers located both in and outside the stadium. The plastic cups were then recycled into a variety of products. In addition, fans are using 100 percent recycled napkins, compostable plates and cutlery. The program was expected to divert roughly 165,000 pounds of cardboard and plastic material from the waste stream annually, saving an estimated 2,180 cubic yards of landfill space. Actual impact, as well as information on whether this program is still active, is unknown. Great program, the kickoff was picked up well, but Cubs get an out for post or during-projects comms. The link provided in the first-run tweet led to the Cubs’ 1060 Project webpage. The 1060 Project started after the 2014 season and is ongoing. It is the restoration project for Wrigley Field under which a number of sustainability initiatives are being/have been pursued. First of all, major props for preservation. Not only is utilizing an existing structure a major green building win, but MLB has so few of its pinnacle stadiums left, we need Wrigley to stay! The project will also have/has a positive impact on jobs (diversity is a stated focus, but is local hiring Cubs? ), the surrounding community, and of course the Illinois/Chicago economy. 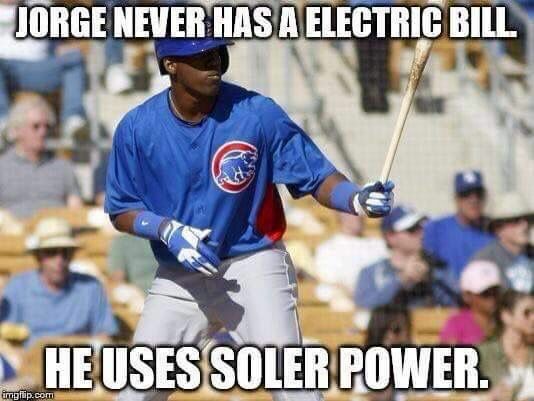 And of course, the Cubs have their very own Soler Power. The series may be tied at 1-1, but if it were left up to sustainability alone, we may have a champion sooner than expected. See how the Cleveland Indians match up in sports sustainability in Part 2 of this post. President Obama names October 6th, 2016 Green Sports Day. 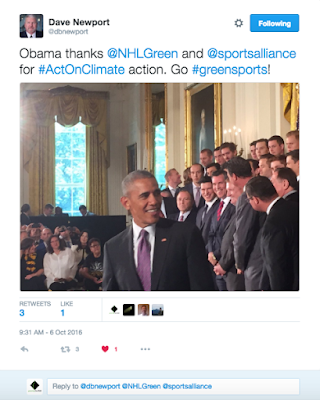 In addition to congratulating the Pittsburgh Penguins for their 2016 Stanley Cup win, President Obama also acknowledged their and the NHL's commitment to the environment, naming today the first annual Green Sports Day. "Individuals and organizations across the country are stepping up to take action on climate change through sports, from the greening of athletic facilities, to preparing for the impacts of extreme heat on players, to educating and engaging fans." The University of Colorado was the first NCAA Division 1 team to have a green sports program (Ralphie's Green Stampede established in 2008). CU's Folsom Field is also the home of zero-waste game days. Having proved their commitment to sustainability (this season they unveiled a net-zero Indoor Practice Facility), the Buffs have focused their attention on fans. Through various fan engagement methods and programs, Ralphie's Green Stampede is leveraging the power of sport to encourage fans to practice sustainable behaviours at home, work, and play. This focus is exemplified in Water for the West, a comprehensive water initiative that launched during last year's basketball season, and will expand to football at the team's Sustainable Gameday on October 15th. Water for the West asks fans to pledge via text to conserve water. For each pledge, 1000 gallons of CU's water use is offset with Colorado River Basin restoration projects. They then keep in touch with fans through text message, providing tips for meeting their pledge and updates on the Buffs H2O successes. Water for the West also created a program called FLOWS that sends students into the community to install low-flow water fixtures in community-members' homes. "CU and the Green Sports Alliance are setting up to challenge all collegiate athletics programs to make similar commitments: "Building off of CU Boulder’s commitment to maintain a 100% water-balanced, water-consumption goal for its athletics program, CU Boulder and GSA are partnering on the launch of a new College Sports Water Resiliency Challenge. The Challenge invites college presidents, chancellors, and athletic directors to pledge ambitious water-resilience goals for their campus sports programs. Modeled after successful programs in the Pac-12 Conference, the Challenge focuses on: conserving and reducing water use in athletics facilities and on sports fields through smart-water infrastructure and management practices; partnering with communities in reducing water use; and partnering with students, non-governmental organizations, and companies through Change the Course on restoring rivers, wetlands, or groundwater ecosystems to enhance climate resilience." The Pac-12 Conference also announced today that they will hold an All-Conference Sports Sustainability Summit, making them the first to unite all teams in a conference for the green sports cause. The Buffs may not have a varsity baseball team, but other than that small (personal) misfortune, they're Athletics program is killing it-- both on the field and off, actually. I can't wait to see how they and the GSA can expand Water for the West. And as a reader, don't forget to Run with Ralphie's Green Stampede, be a Water-Wise Buff, and conserve water at home, work, and play! Green Sports at the White House. Today is a big day. The first annual Green Sports Day! On the tail of the Pittsburgh Penguins' trip to meet President Obama and receive a hearty congratulations for their 2016 Stanley Cup win, President Obama also thanked the NHL's sustainability program (NHL Green) and the Green Sports Alliance for their leadership and action in stemming climate change. And the Green Sports Alliance has officially proclaimed today -- October 6th, 2016 -- the First Annual Green Sports Day. "Serious environmental issues threaten our communities and the health of our planet. Sports is a $1.5 trillion industry around the world. As the industry association that convenes stakeholders throughout sports, the Green Sports Alliance is uniquely positioned to amplify environmental causes and activate passionate fans everywhere. Therefore, the Green Sports Alliance proclaims today, October 6, 2016 as the first annual Green Sports Day. Celebrate next October the accomplishments achieved throughout the year." You’ve identified your keywords, but is your site using them properly to optimize search engine results? After following the outline explained in Part 1, you should have a list of keywords. It is now time to assess your page for keyword use and performance. AKA: Line up your keywords and start googling. As you search, keep track of where your page shows up in the search results. We did this for our green sports program and about 25 keywords. A truncated version of how we tracked search results is below. Now that you know your keyword shortlist and your personal search engine ranking, do you wish you ranked higher for a specific keyword? Say, “your team name” plus sustainability? If so, then it’s time to optimize. Use the keyword 1-3 times in the content of your page -- and make sure that your pages can be crawled by the google spiders. ← If you don’t already know for certain your site and individual pages can even be accessed by search engines, definitely read through that link. Use identified keywords in the alt text on images. Create a series of web pages with different categories of information targeted to specific audiences. Make sure the pages are linked together so that they are crawlable by search engines, and include other audience-specific keywords in relevant page titles and extended URLs. Look at keyword competitors: Perform a three-minute audit for pages that rank high for searches of your keywords. If applicable, model their keyword use in your content (while still staying unique…). Include your keyword(s) in the meta description tag to help to attract clicks by searchers reading the descriptions on the results page. The meta description isn’t taken into account for google rankings, but the number of clicks is and therefore the description is important for SEO. This post is adapted from a study performed by Shawn Lindabury, Margot Montouchet, Meghan Radelet, and Monica Rowand; MBA students at University of Colorado Boulder.